Feb 24, 1:00pm – Join youth and adults taking action! It’s often said that climate recovery actions should be taken for the sake of the next generation. In that spirit, the Oregon Sierra Club and Our Children’s Trust are hosting a forum to explore local climate action—what has been done in the past, what youth leaders across the nation are doing, and what local youth have to say. 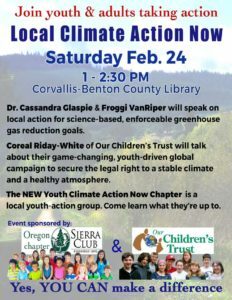 Come join us on Saturday, Feb 24 at the Corvallis-Benton County Public Library. Free and open to all!